women architects in Northern California; early women architects of the San Francisco Bay Area; - womenarchitectss jimdo page! 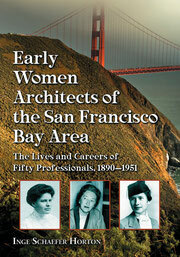 In October 2011, Inge S. Horton won the prestigious 2010 Milka Bliznakov Prize of the International Archive of Women in Architecture Center at Virginia Tech, Blacksburg, VA for her book Early Women Architects of the San Francisco Bay Area - The Lives and Work of Fifty Professionals, 1890-1951. The jury commented: This work deserves to be seen as a model for recovering those unknown histories from other places that reveal the contributions of women to the built environment. Overall, the book offers a welcome, continuing challenge to today by illuminating the manner in which women of a previous era located a creative approach to the profession. No. 23 Fall 2011 on Page 6.
features short chapters about the Emergence of Modernism in California, "Transitional Women Architects", Creating a New Generation of Modernists: Architects Educated at UC Berkeley and Architects migrating to the Bay Area. Dave Weinstein also picked up the topic in his blog and wrote about Pioneering Women in Modernism in the newsletter of the Eichler Network. You can order the book Early Women Architects of the San Francisco Bay Area (ISBN 978-0-7864-4656-8) at $65 plus shipping $5 for the first book, $1 for each additional book and tax for NC residents, directly from the publisher, McFarland & Company, Inc., Box 611, Jefferson, N.C. or by phone (800) 253-2187 using your credit card. See also www.mcfarlandpub.com. The book is also available from Amazon at the same price of $65. The book is carried by local architectural book sellers such as William Stout Architectural Books, 804 Montgomery Street, San Francisco and 1605 Solano Street, Berkeley; Builders Booksource, 1817 4th Street, Berkeley; and University Press Book, 2430 Bancroft Way, Berkeley. In Europe, North Africa and the Middle East, order from: The European Group, www.eurospangroup.com. In Australia and New Zealand, order from : DA Information Services, www.dadirect.com.